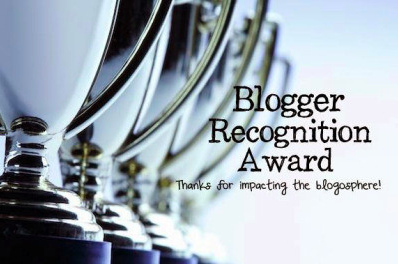 After a bit of brainstorming, I have decided that I must bring more blogworthy articles to my blog. 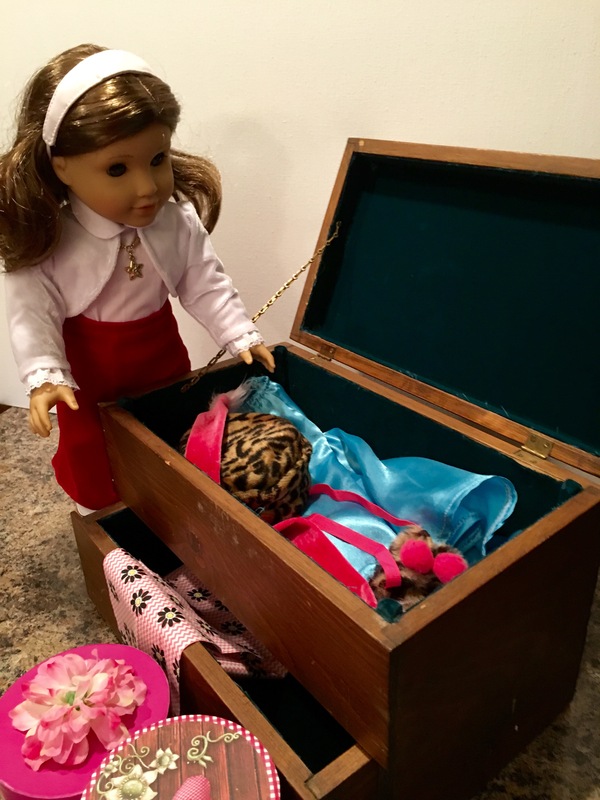 Crafty posts are great, but I think that we would like to have even more fun with the dolls. 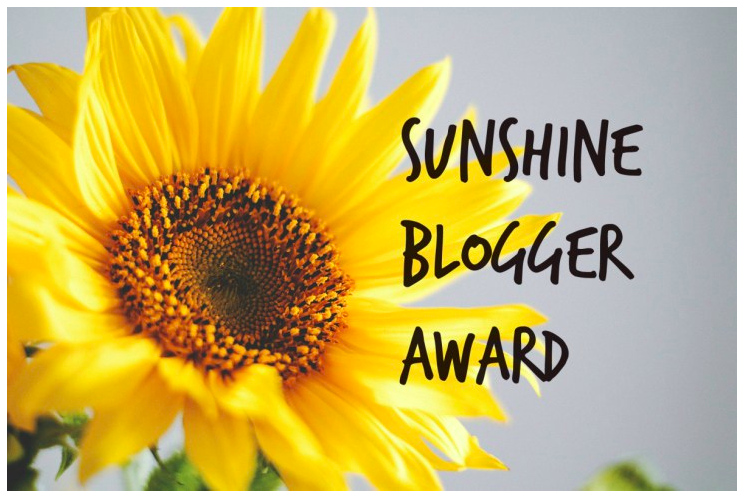 So without further adieu, I am excited to introduce you all to a new highlight of my blogland! AG Inspired Fun Fashion! How it works is this: Each week, I will be putting together an outfit that represents one of the characters in AG land. 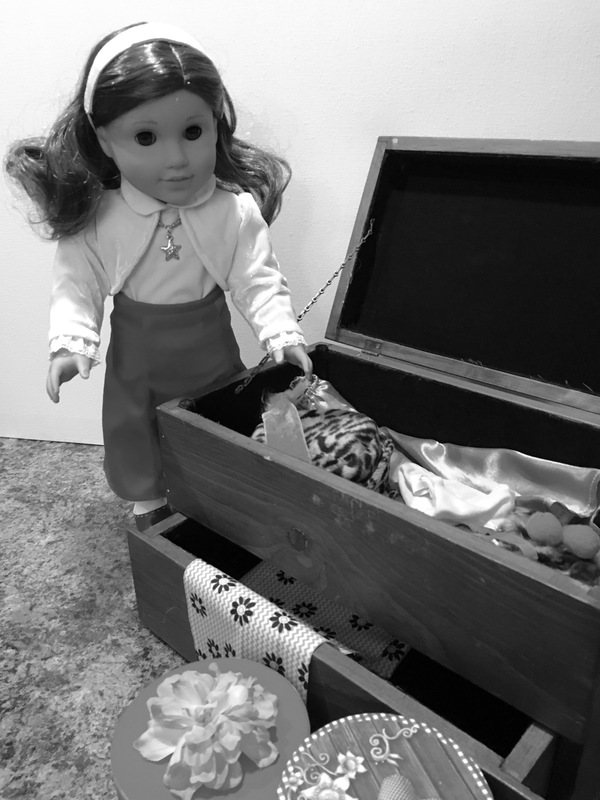 By doing so, I would like to try to demonstrate how to use what you already have on hand to dress your dolls up just like AG characters. I hope that this will be something that you will all enjoy! This week, I will be featuring Rebecca Rubin. Luckily, we already own a Rebecca doll, but if you don’t, that’s okay too. 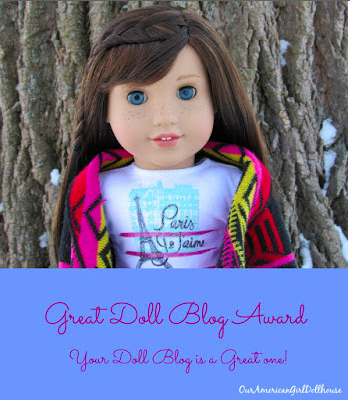 Just follow along with your own favourite doll friend, and see what you can come up with! Rebecca Rubin is a Russian/Jewish girl from 1914 so her outfits are pretty classy and modest–nothing modern here! 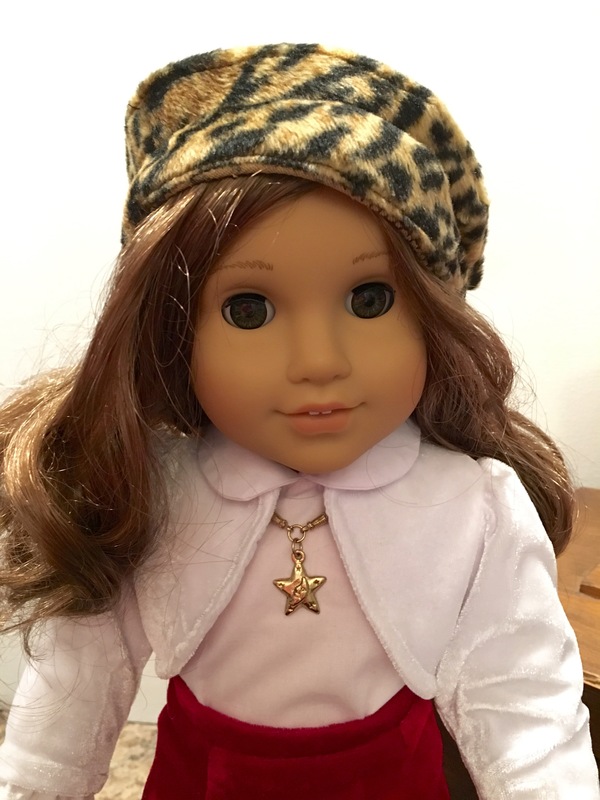 Here’s a look at the outfit that we came up with for Rebecca this week! Let me know what you think in the comments below! 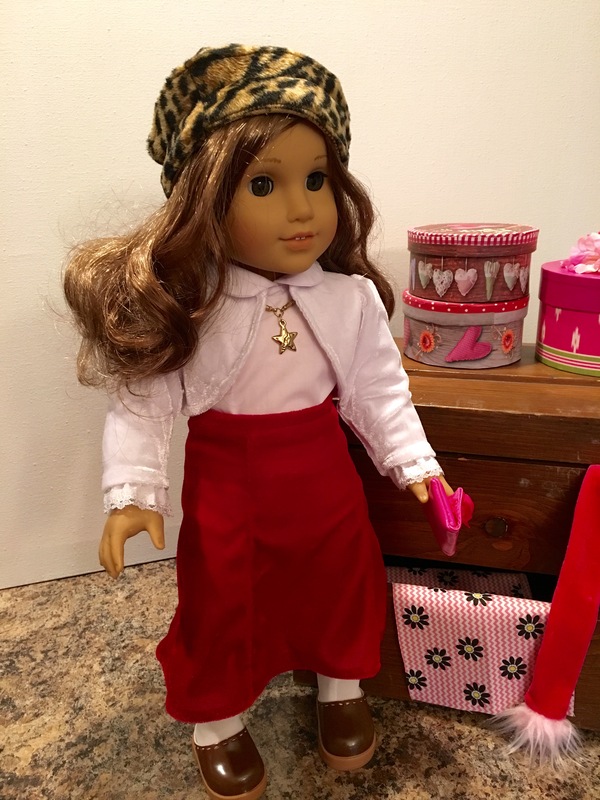 This week Rebecca Rubin is wearing a long, red velour skirt with white tights and brown clog shoes. Her crisp, white collared shirt is paired with a white velour shrug. 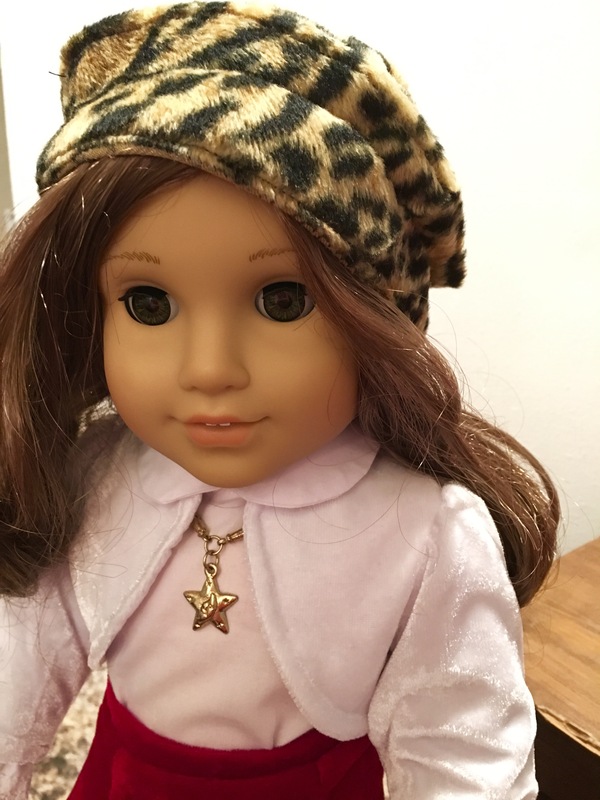 She has a leopard print cap and a pink leather purse with a fabric flower. 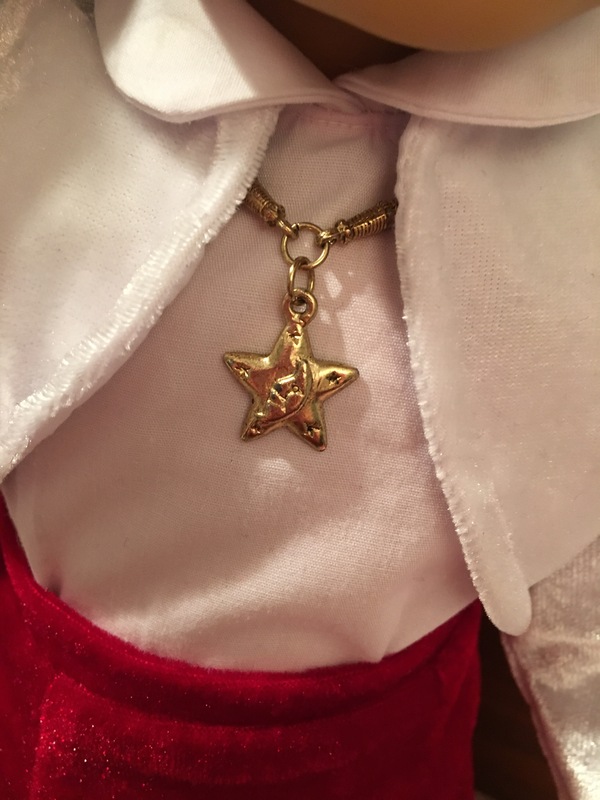 She is also wearing a beautiful gold starfish necklace that she received for her birthday from her Nana. You look so pretty Rebecca! 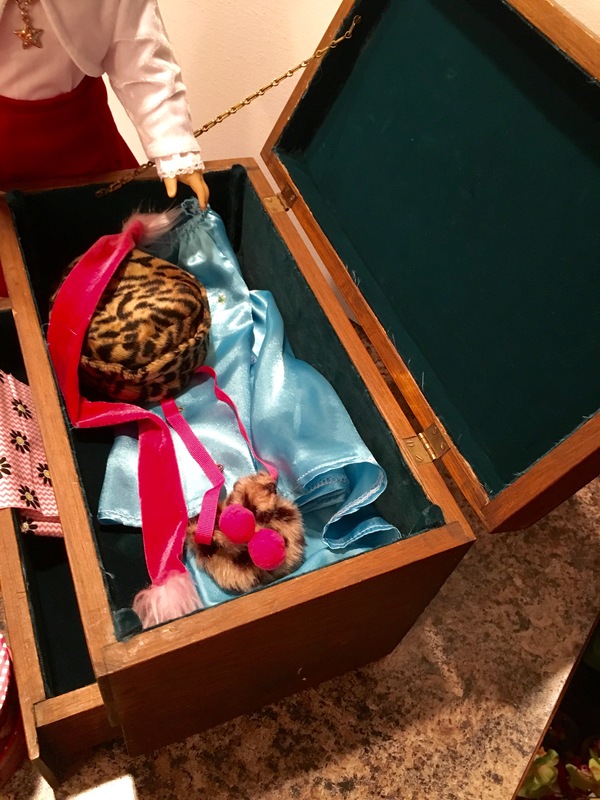 Rebecca’s trunk is a favourite thrift store find. 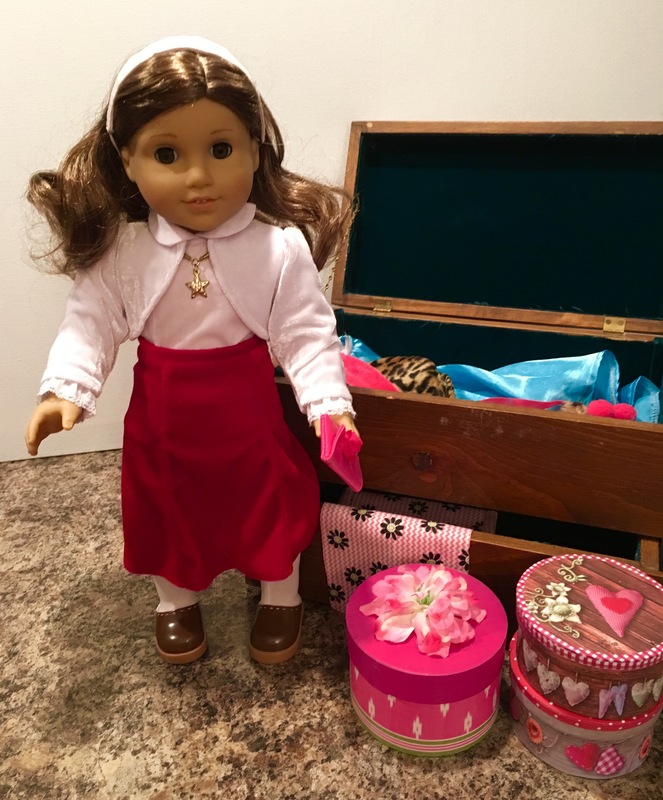 It is perfect for storing all of her dress up items. It has a hinged lid at the top and a nice big drawer on the bottom. 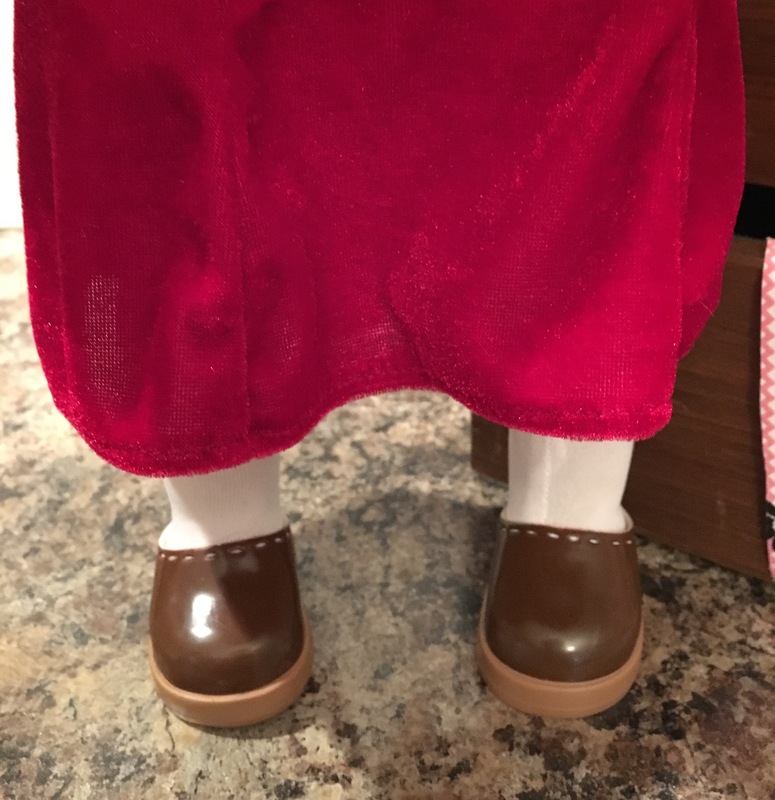 These sweet little clogs come from a Tolly Tots doll, but they fit the AG doll feet just fine. I liked how simple they were, just perfect for Rebecca’s modest look. 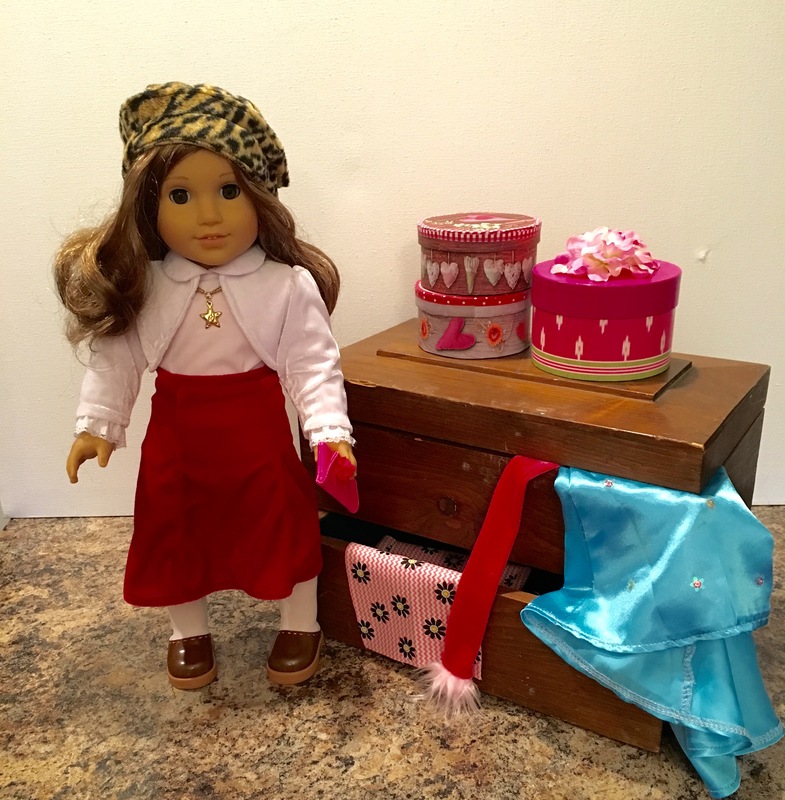 Rebecca’s hatboxes are dollar store items. 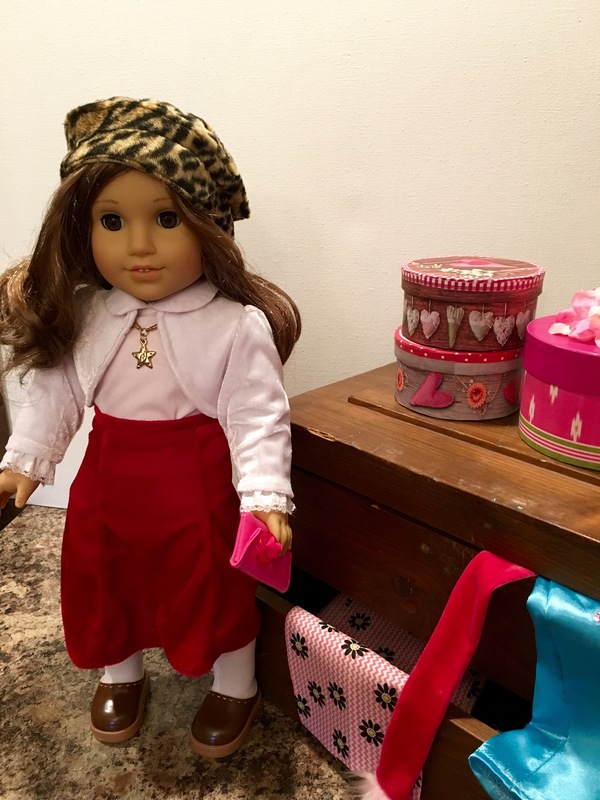 I can’t say enough how much we love the dollar store for dolly finds! 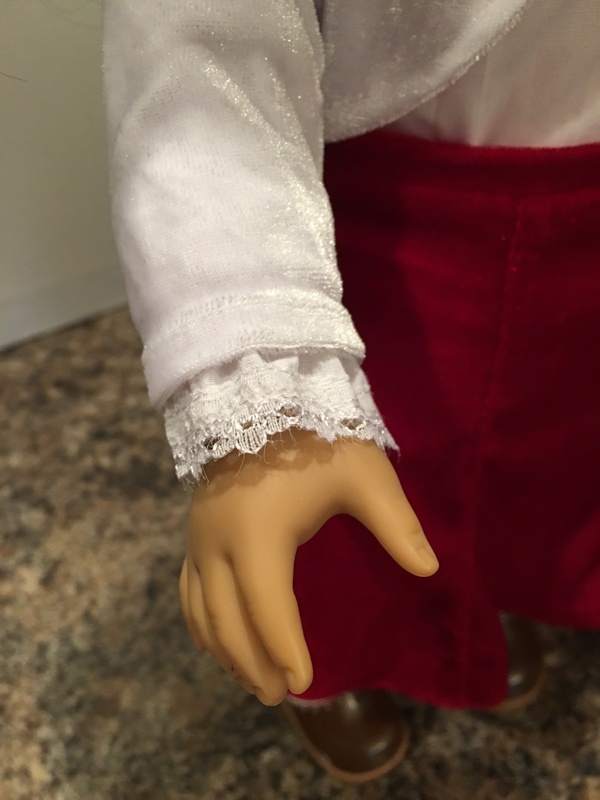 The sleeves of Rebecca’s collared shirt have these pretty little lace cuffs. I just had to showcase them by having them extend out from the bottom of the shrug sleeves. Here is Rebecca with her white leather hairband. Her hair has a lot of volume to it, so I think it is best pulled back. I just think she looks so cute! 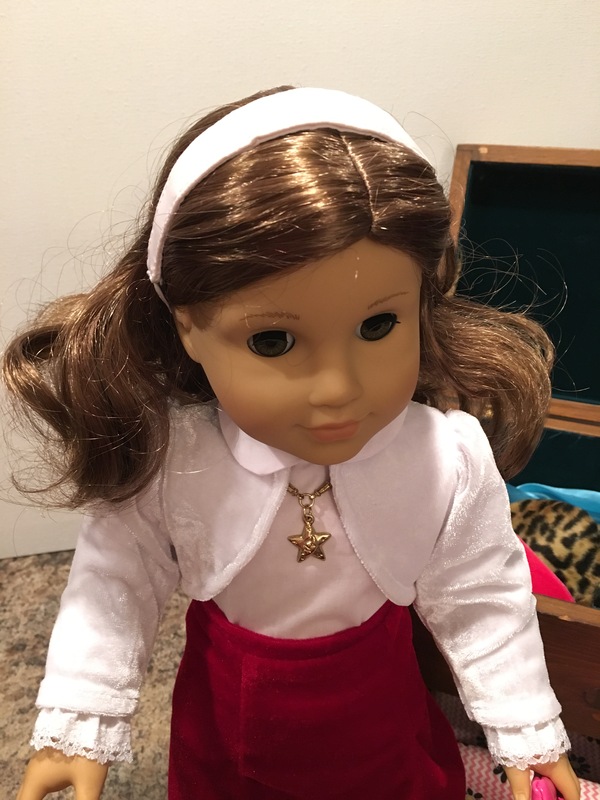 Rebecca’s white shrug is a Newberry doll buy from Sears. 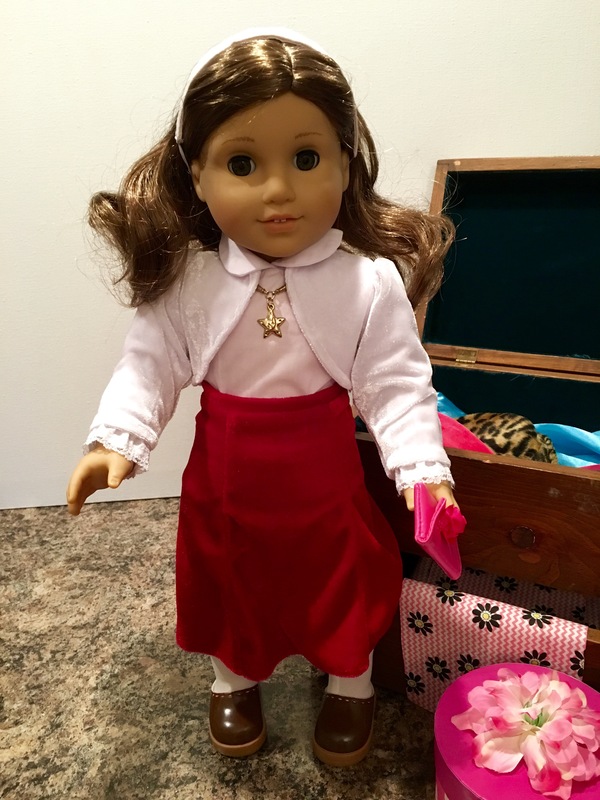 Her velour skirt was among a large lot of doll clothes that we received a while back, along with the collared shirt. Her pink purse is Our Generation and the white tights are AG. I just filled up the trunk with some pretty coloured fabrics, but there is plenty of space in there! I hope you enjoyed Rebecca Rubin as our fabulous fashion feature this week! Let me know what you think! Then stay tuned for more fashion fun next week with Caroline Abbott! That trunk is fabulous! It would be a favorite find here too! Rebecca looks great in that outfit and I love how the outfit is created from various pieces found here and there.